This kit can be configured in Many ways, between S300 and S400 Turbos, the options are almost endless! This kit replaces the factory compound turbo system with either an S300 or S400 Borg Warner turbo. Power gains and "drivability" will entirely depend on the turbo chosen, as well as what other mods are done to the truck. If there are any questions regarding setup, please do not hesitate to call in and ask! *Each different turbo is capable of a different power level, and will drive differently on the street. Below is a basic breakdown. S366: Capable of about 600 WHP, Street manners similar to stock, slightly cooler EGT's with good tuning S369 SX-E: Capable of about 650 WHP on STOCK fuel, Capable of 700+ with small nozzles and dual pumps. Stock Fuel street manners are very good. S467: Capable of about 670 on stock fuel, With proper nozzles, dual pumps and tuning it can produce close to 800 HP. This Kit will come with everything needed for a complete, simple and clean install. 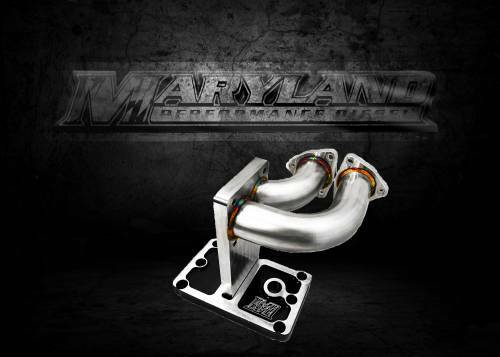 It will ship with the billet pedestal, pedestal install kit, turbo install kit, as well as the turbo itself. IMHO, best of the best. I love my kit! I have the S467 on mine. When my 6.4 turbo When bellying up I was looking for something different. What I didn’t like about the standard truck unit was always a sound like a massive vacuum cleaner at the exhaust and the constant high turbo pressures. Also the replacement cost of $3500 brand-new or $2000 rebuilt in the unit alone. Rebuilt units have not been working out very well. Also using a calculator for fuel economy I have reached 17.5 MPG's avg. the Ly O Meter on the truck said 18 to 19 avg. my driving habits are 20% city the rest is freeway average 80 miles a day. I did a cab on removal of the old turbocharger, which was a real bear the installation of the new unit went very well outside of a few modification which is required with a kit like this. When my 6.4 turbo Whet bellying up I was looking for something different. What I didn’t like about the standard truck unit was always a sound like a massive vacuum cleaner at the exhaust and the constant high turbo pressures. Also the replacement cost of $3500 brand-new or $2000 rebuilt in the unit alone. Rebuilt units have not been working out very well.